To the sun of the Ancient Translation (Ngagyur Nyingma) teachings, supreme protector, most excellent Sogyal Rinpoche, together with the rest of the honourable Hor Lakar family, and the assembly of the Rigpa sangha, I respectfully offer the following message. According to your letter, at 7.20pm on the evening of the 24th day of the third lunar month of the Iron Hare year of the 17th calendrical cycle, the most excellent Khandro Rinpoche, Tsering Chödrön, let her wisdom mind merge with the expanse of the dharmadhatu, amidst wondrous signs, and rested in tukdam. As a result, you kindly sent an offering, together with a scarf of the purest white silk, and asked us to perform the ‘reminding instructions for one who is in tukdam’ (tukdam saldep). Just as you requested, I carried out these ‘reminding instructions’. In addition, as you also requested, around four hundred of us gathered together to practise the Dharma-king Minling Terchen’s profound terma of Avalokiteshvara, Zabmo Deshek Kundü, during the fourth week, which began on the 19th day of the fourth month. Together with this, we performed elaborate practices for Khandro’s gongdzok (fulfilment of wishes), and prayed that, having departed into the realm of peace, her wisdom mind may reach perfect realization within the expanse of great bliss, the dharmadhatu. 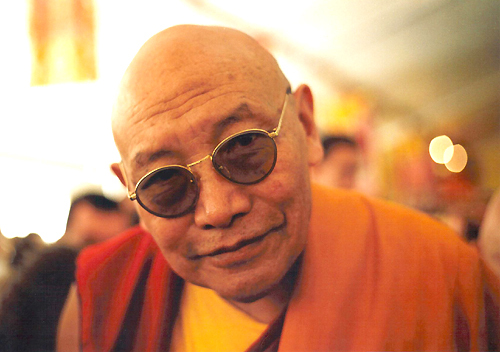 To Rinpoche and the family, we all wish to convey our deepest sympathy. We are sending a symbolic offering and a kata towards the practices that will be performed before the precious kudung. And to Sogyal Rinpoche and Mayum-la, we offer our condolences, symbolized by a gift and a scarf of whitest silk. To you, master of the vast expanse of omniscient wisdom, I offer these words. I, the one called Dzarong Trulshik, offered this on the 26th day of the 4th month of the Iron Hare year, 2011 according the Western calendar. Also my gratitude goes to Sogyal Rinpoche for inviting you. May Your life be very long and may all your aspirations be fulfilled. May Khandro bless us all!